In August I participated in a 72 hour hackathon called StartupBus that took place on a bus driving from NYC to New Orleans. Once there we met six other buses and my team competed against 21 other teams over three rounds of elimination to ultimately win the competition and receive investment offers in our new startup company, Daisy. Daisy is a funeral planning platform that guides you through each step of planning your loved one’s funeral. Through its complementary services, Daisy tells you what you have to do and shows you how to do it. The participants of the Startup Bus were tasked with building a startup company from the ground up in only 72 hours. Before boarding the bus, all participants were asked to create a 90 second pitch for a startup they wanted to create. When I heard the pitch for the then unnamed funeral planning app, I knew this was what I wanted to work on during the hackathon. I approached the talented developer who pitched the idea, and together we chose two marketing focused people to round out our four-person team. My team began by researching the competition in the funeral planning space and similar spaces, such as wedding planning. The Knot: While The Knot is for wedding planning, not funeral planning, we found that its offering was very similar to what we had in mind for Daisy. I drew inspiration from their personal wedding checklist, vendor list, and wedding website. Examining wedding planning apps and products was valuable because weddings and funerals are both emotional events. The major difference is that a wedding is often painstakingly planned over the course of a year, while a funeral often has to be planned in a week or less. Daisy had to take many features of The Knot and compress them into a much shorter timeline. Funerals 360: Funerals 360 is a website that offers articles about funeral planning, a funeral checklist, vendor comparisons, among other services. I tried to plan a funeral on this website to identify Funeral 360's shortcomings and how Daisy's user experience could improve on that. One of my biggest takeaways was that a long checklist without navigation is confusing and hard to fill out. 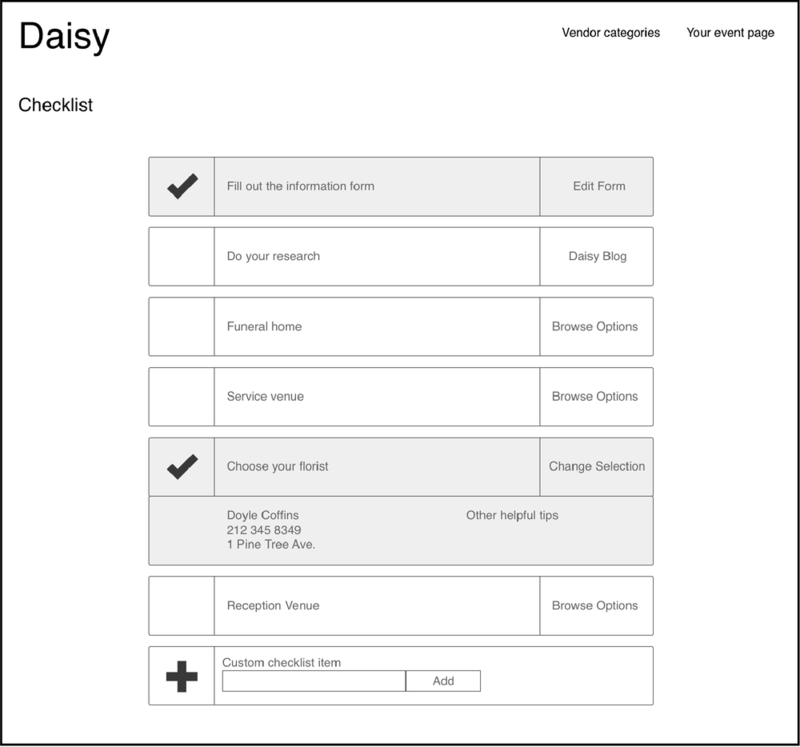 I knew that the checklist experience would be very important, and made Daisy's funeral planning checklist more easily navigable by separating forms into different parts of the checklist. This lets the user tackle several forms rather than how Funerals 360 has one massive form in the guise of a checklist. While using Funerals 360, I had trouble finding the checklist after navigating away from it, because there was no dedicated menu button for it. The checklist is too important to hide, so for Daisy I made a dedicated button on the menu for the checklist. It's never more than one click away. E-Funeral: We found out about E-Funeral through one of the mentors on Startup Bus whose friend was the founder. The company did not succeed, and we were hoping to get in contact with the founder to ask why he thinks E-Funeral failed, and what advice he had for us. CRäKN: This service is a funeral managing platform. I researched it to see how they address the needs of funeral directors. While our product, Daisy, focuses on people planning their own or a loved one's funeral, we needed the buy-in of funeral directors to be a success. Seeing what CRäKN does helped us understand a side of the funeral planning process that no one on our team had experienced before. I created a user persona to help inform the team's decisions during the prototyping process. 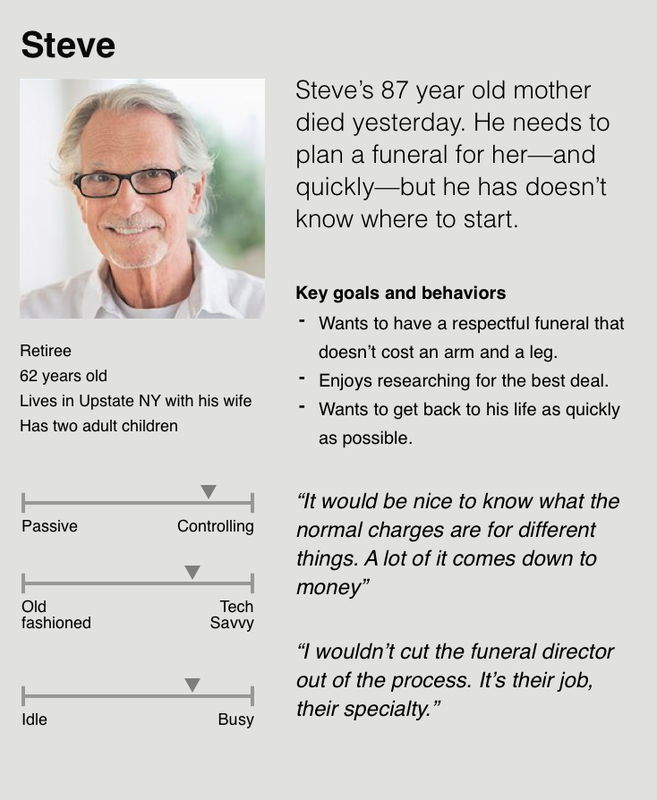 I based the persona on my father who recently had to plan a funeral and is part of our target demographic. 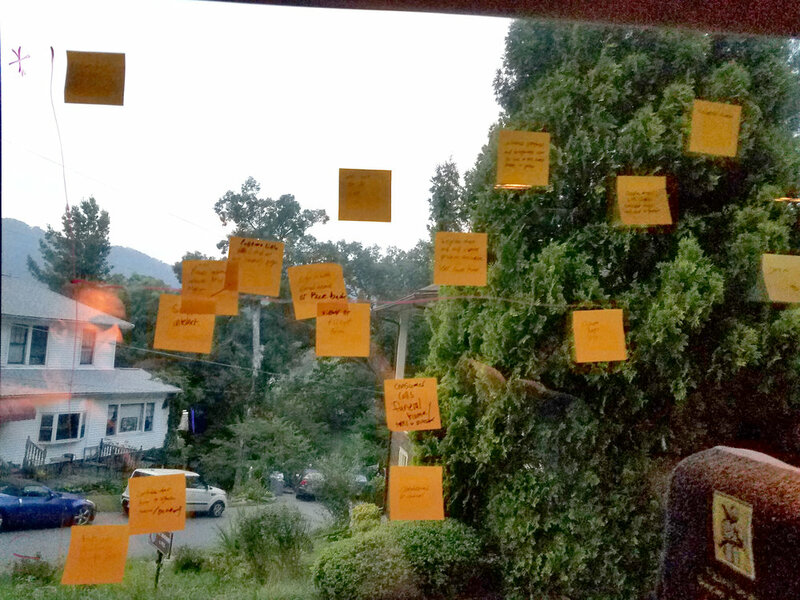 The goal of this process was to help us empathize with this user and understand their needs. Daisy's goal is to take the user from the sad situation of losing a relative to getting closure with a well-executed funeral. To that end, I created an experience map to get an understanding of our users' headspace during their time using Daisy. The experience map helps us recognize that the user is probably going through one of the most difficult times in their lives, and that Daisy's user experience design needs to be sensitive to that. This map informs when we should and should not take advantage of potential marketing moments, sponsored content and monetization strategies. This map also helps us recognize where we can strive to make an experience more positive. For example, one of the most negative experiences on this map is "Choose to fill out a for about the deceased." This helped us recognize that the user may not want to fill out a lengthy form about the deceased right away. To make it easier for the user, we opted to give them the choice to skip the form and fill it out later, however in the copy we stress the benefits of filling out the form now. White pages represent ones we planned to build for the minimum viable product. Grey pages represent pages we plan to build in the future. The checklist is the most important part of our web app. It is the first thing people see after filling out an information form about the deceased. This checklist begins as a quick overview of what needs to be done to plan a funeral, and while you use it it transforms into the actual plan. This plan can then be printed to be shown to the funeral director, or shared online with family who are helping you plan the funeral. While our web developer was busy bringing the prototypes to fruition, myself and the two marketing people on our team worked on a simple website to announce Daisy, and more importantly gauge consumer interested. 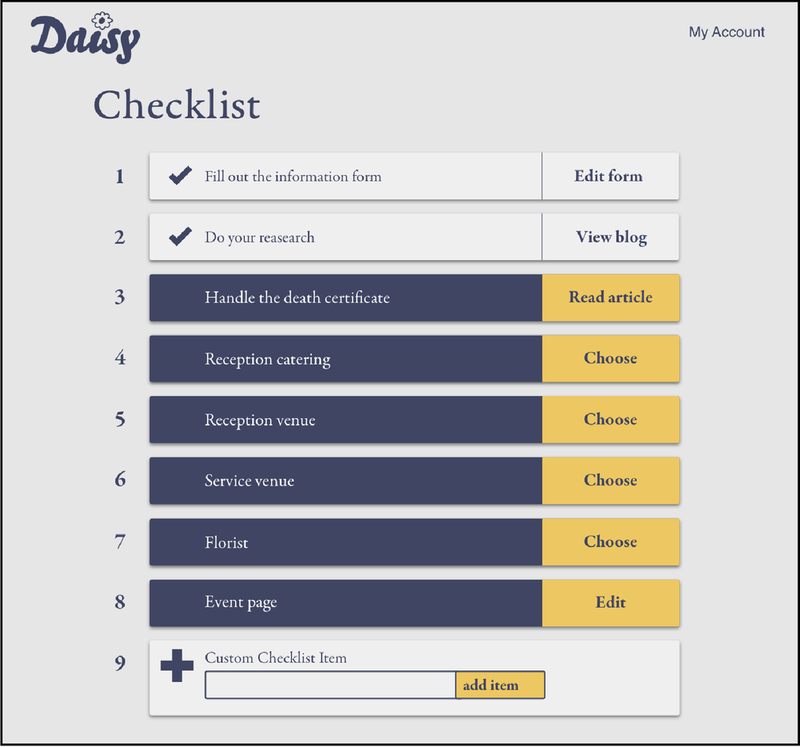 This website had a brief description of Daisy and its services, a blog where we wrote two articles about funeral planning, and an email signup form. We used SEO techniques while writing the blog posts to make our website rank on searches for "funeral planning" and related keywords, so that people could find out about Daisy through organic search. We created a social media presence for Daisy and shared the blog posts and website through those channels, and spent about $200 to boost the posts on Facebook. The likes, comments, and email signups generated gave us valuable feedback on Daisy and its viability as a service. Screenshot of our Facebook analytics partway through the campaign. We have chosen to temporarily take down the Daisy website and social media profile. We gathered the information we needed from this experiment, and are now in "stealth mode" so we can adjust the value proposition and other details about Daisy for a more official launch. At the end of the 72 hours, we arrived in New Orleans and entered the competitive stage of Startup Bus. 23 teams pitched their ideas to judges. There were three rounds of elimination over the course of two days. In the end, we won Startup Bus North America 2017. After returning to NYC, the team is looking towards the future of Daisy. We already have interest from potential investors. During the hackathon, we were featured in the Charlotte Agenda. We were also featured in the five-part Startup Bus podcast mini-series by Gimlet Media. I went on to attend Startup Bus a second time in April 2018. My team didn't win, but the second time was even more transformative and life changing than the first. I will definitely participate again as a rider or mentor.